San Diego Stick player Tom Griesgraber has a busy summer ahead of him indeed. A graduate of the Berklee School of Music, Tom began playing Stick in 1997 after hearing Tony Levin play at the NAMM show that year and has been on a steady rise ever since. Tom has already released two records with his band Agent 22. The group has received much critical acclaim in the San Diego area and, after winning a Best of the Year competition in the area, began landing some high profile gigs with groups like the Tony Levin Band, California Guitar Trio, Al Dimeola, Larry Carlton and Steve Lukather, Tower of Power, the Dixie Dregs, and Jazz Mandolin Project. Recently, Tom has been working to complete two projects. One is a solo CD with guest appearances by Tony Levin/Peter Gabriel drummer Jerry Marotta, the California Guitar Trio, and Agent 22 drummer Darren Debree. The other is a recording project with drummer Jerry Marotta as well as keyboardist Harvey Jones. 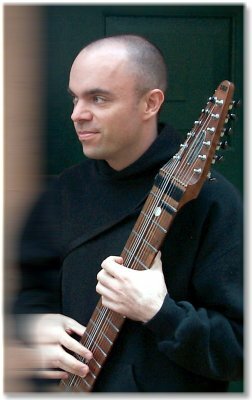 May and June will also see Tom teaching at the 2003 Oregon Stick Seminar as well as heading out on a US tour in support of the California Guitar Trio. To learn more about the seminar, check the seminar page. Tour dates for Tom's road trip with the California Guitar Trio are listed below.